The global rotogravure printing machine market has witnessed growth in the past decade, due to increase in. This has resulted in a major shift in consumer preference, which has affected the global rotogravure printing machine market in a positive way. As a result of the fast-paced lifestyle, several consumers are switching to more organized retail outlets such as hypermarkets and supermarkets. This is likely to have a positive influence on the global rotogravure printing machine market. Also, in the coming years, consumer preferences are likely to be driven by the branding created using the printing technology. Spurred by these factors, the global rotogravure market is likely to exhibit steady growth between 2017 and 2025. The rotogravure printing machine market has been on the basis of number of colors, automation mode, drying Source, substrate, ink and end Use. On the basis of colors the rotogravure printing machine market is further segmented into four sub segments less than 2 colors, 2-5 colors, 6- 8 Colors and greater than 8 colors. Of these, the greater than 8 colors segment is estimated to dominate the market, in 2017, holding nearly 36.1% of the overall market value. On the basis of automation mode, the rotogravure printing machine market is further segmented into automatic & manual rotogravure printing machine. Among these, the manual rotogravure printing machines are likely to hold the dominant share of 50.7% in the market in 2017. On the basis of drying source, the rotogravure printing machine market is further sub segmented into electrical, thermal fluid, and gas. The Image is dried with the help of with these three drying sources. On the basis of substrate, the rotogravure printing machine is further sub segmented into plastic, aluminum foil, paper, and paper board. Among the ink segment, the solvent segment is anticipated to dominate the market, over the forecast period. The global rotogravure printing machine market by end use industry, has been segmented majorly into two segments publishing and packaging. Among these, consumer goods segment is anticipated to be the dominating segments, over the forecast period. The global market has been segmented into five regions, i.e. North America, Latin America, Europe, Asia Pacific region (APAC), and Middle East & Africa (MEA). 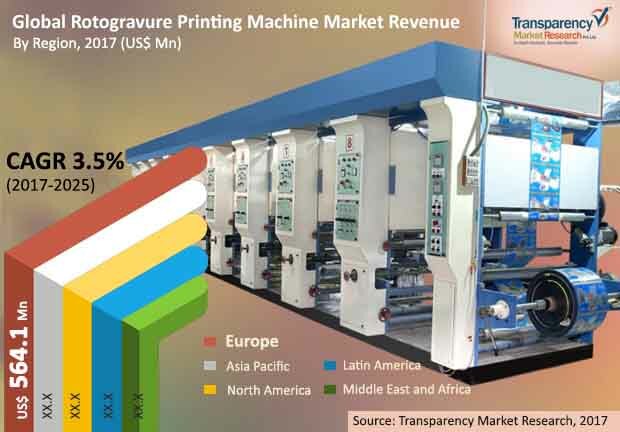 Among these regions, the Europe rotogravure printing machine market held dominance, however, in the coming years Asia Pacific is forecast to emerge at the fore, relegating the Europe market to a lesser spot. The Asia Pacific market is strengthened by the rapid urbanization witnessed in the region, besides changing lifestyle of consumers. Nonetheless, TMR forecasts steady growth for the market in developed regions through the forecast period. In the coming years, the Middle East and Africa is expected to emerge as the most lucrative market for rotogravure printing machines, exhibiting growth at the highest pace. Some of the key players in the global rotogravure printing machine market include J M Heaford Ltd, Bobst Group SA., Windmoeller & Hoelscher Corporation, KKA Gmbh, ROTATEK S.A, Uteco Converting SpA, Shaanxi Beiren Printing Machinery Co., Ltd., Hsing Wei Machine Industry CO.LTD, QUEEN'S MACHINERY CO., LTD, Pelican Rotoflex Pvt Ltd., HYPLAS MACHINERY CO LTD, Fuji Kikai Kogyo Co Ltd, Weijin Machinery Industry Co. Ltd, Jiangyin Lida Printing & Packaging Machinery Co.Ltd, and Officine Meccaniche Giovanni Cerutti SpA. The report provides detailed competitive and company profiles of key participants operating in the Global market. Key Players of the rotogravure printing machine market are J M Heaford Ltd, Bobst Group SA., Windmoeller & Hoelscher Corporation, Comexi Group S.L. DCM-ATN, KKA Gmbh, ROTATEK S.A, Uteco Converting SpA, Shaanxi Beiren Printing Machinery Co., Ltd., Hsing Wei Machine Industry CO.LTD, QUEEN'S MACHINERY CO., LTD, Pelican Rotoflex Pvt Ltd., HYPLAS MACHINERY CO LTD, Fuji Kikai Kogyo Co Ltd, Weijin Machinery Industry Co. Ltd, Jiangyin Lida Printing & Packaging Machinery Co.Ltd, Officine Meccaniche Giovanni Cerutti SpA.